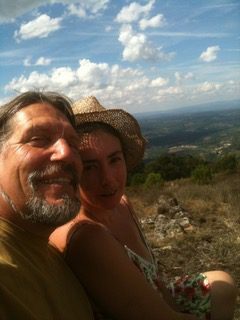 "We obtained our land in Portugal with a spring and terraces, neglected for many years. Our intention was to breathe new life into this land with her beautiful views and life giving waters, creating both a home for ourselves, and a space to offer workshops, groups and retreats to others, encouraging creativity, celebration, personal growth and conscious connection to the land and each other. Our work is inspired by our passions; music, Bio-dynamic gardening, Earth healing, conscious inquiry and meditation. We named our project Solaria after the spring that had called us to this land. In October 2017 a firestorm raged across Portugal. It burnt the land and our motorhome. The foundation we had set in place to begin building our vision was gone. Since acquiring the land we had faced many challenges and setbacks that we could not have imagined at the start. The fire left us feeling heartbroken and defeated, but crowdfunding is a beautiful thing. We have been so moved by the support we have received so far. It has helped re-ignite our vision, and the commitment and determination needed to bring it to fruition. In the final days of our campaign we are asking once more for help to reach our target. The donations we receive will enable us to start to build the basic infrastructure needed to hold our first groups; a small space for ourselves, compost toilets, and washing facilities, an outdoor covered kitchen and our first Bio-dynamic gardens. There is an open invitation to all to spend time with us at Solaria, to drop into what it means to be together on this precious earth at these challenging times, with conscious intent to work to create a heartful and harmonious human space." Check out Allen & Susan's crowdfunding campaign below!